This dialog is used when you insert a loop into the course. 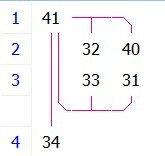 It is used to configure the number of "branches" in the loop. In a loop, you start with the center control, then run a "branch", return to the center control and run the next branch, etc, until you have run all the branches. To spread competitors, they run the branches in different order. Condes creates course variations. In the below example, a loop is created at the first control in the course, and it has 2 "branches", A and B. A loop with 2 branches is often referred to as a butterfly. This results in 2 different course variations: AB and BA.